American Legion Post 290 Commander Kilby All of Kilby’s Fabrications! In the video where Commander Kilby addressed the Stokes Co. Board of Elections (BOE) he makes a statement at 0:25 in the video concerning the assault on Nov. 8, 2016. 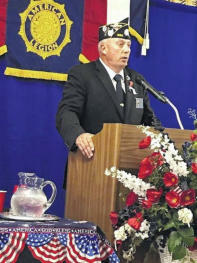 Kilby, “One of the things I want to correct on Mr. Hewett, he said, that he was assaulted by American Legion people . . . there is no evidence that he has been assaulted…” https://www.youtube.com/watch?v=khB1aDFbqpE What! No evidence that I was assaulted, this statement was made to the BOE with the intent to discredit my previous comments and to the public that was present at this open BOE meeting. Again, no evidence! Please refer back to page, “Ronald Shouse Charged” in the drop down menu. Does Kilby live in some alternate universe that ignores facts such as the King Police Department being called, investigating a crime and bring charges for “Assault with a Deadly Weapon” as well as “Careless & Reckless Driving.” I mean really, what reality does this man live in? As a former Forsyth Co. Sheriff Deputy certainly he can see that the Police investigated and charged Shouse with a crime. 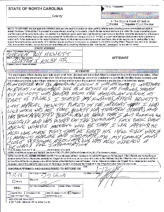 How does Commander Kilby knowing and willfully make a public comment the he [k]nows to be false and untruthful? 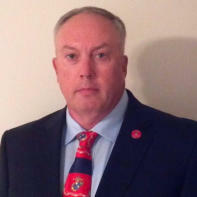 He has violated the American Legion Constitution in members being truthful in all matters of the Legion! What does this say about his values, morals, character, integrity and honesty? Based upon his action before the BOE and at the American Legion Appeal hearing he willingly set his morals aside to serve his and Post 290’s selfish goals. In an attempt to discredit me and make disparaging statements about me to the BOE and community! Commander Kilby brings nothing but shame and dishonor to the office he holds both in Post 290 and the State American Legion as District Commander. Commander Kilby goes on furtherer to state in the video at 0:01:00 an individual approaches me while I was at the American Legion on Nov. 8, 2016 Election Day and tells me I was violating the American Legion Constitution. Good Luck finding that because it never happened! 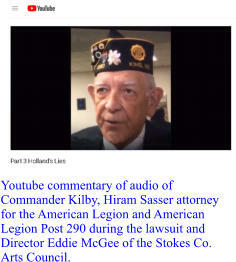 (https://www.youtube.com/watch?v=LoxdpYjDV68) And since you will not be able to find this, Commander Kilby fabricated this story making false and untruthful statements to the Stokes Co. BOE, violating the very American Legion Constitution. Of course you can see his confusion concerning constitutional issues. For someone who states he teaches this, he needs to go back and understand state and federal laws. Kilby claims he teaches constitutional law, but the Faculty & Staff Directory at Forsyth Tech. has him only listed as Program Coordinator Emergency Services. https://www.forsythtech.edu/about-us/leadership-faculty/faculty-staff- directory/?query=Clifton+kilby This is rather disturbing, if he does teach, just what kind of Constitutional Law does he teach? Does he teach students how to be [u]ntruthful in the court rooms and hearings as he did here with the Stokes Co. BOE, at the American Legion hearing and in the untruthful affidavit to a Forsyth County Magistrate? Kilby is running for Sheriff of Forsyth County as well. Will he be untruthful on the stand when called or about deputies he would be in charge of? Kilby’s moral compass doesn’t seem to point in the direction that it should! He is willing to knowingly and willfully make false derogatory statements, untruths and fabricated stories about another Citizen, Veteran and Political Candidate for Office. What kind of man does this to a fellow now (former) American Legionnaire and United States Veteran? I would like everyone to see what type of person Clifton Kilby is who is running for Sheriff of Forsyth County on the Democratic ticket. 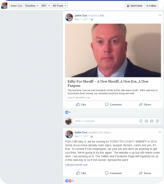 I made this FB page on Jan. 10, 2018 (https://www.facebook.com/VeteransAgainstKilbyforSheriff/) against his running for Forsyth Co. Sheriff and informed him of the page. On Jan. 12, 2018 he took out a Cyberstalking charge against me claiming I “threatened to inflict bodily harm” on him. This individual is just as about as mental as Trump. 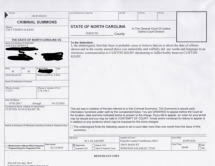 I have a two businesses, one which deals with every Law Enforcement agency in the state of North Carolina. So I certainly know the laws. Advising a political candidate that we are against him is not a physical threat! At no time have I ever done as he as stated. He even exaggerates his claim by putting an offense period from 7/1/17 - 1/12/2018. That would mean I threatened him for several months! I'll be glad to see him in court and get him on the stand! We do have history, one in which he made fabricated and untruthful statements to the American Legion and you can find that at right here. He was untruthful to them and to the Stokes Co. Election Board. I wonder if he failed to read section (e) of the statute: § 14-196.3. (e) This section does not apply to any peaceable, nonviolent, or nonthreatening activity intended to express political views or to provide lawful information to others. This section shall not be construed to impair any constitutionally protected activity, including speech, protest, or assembly. (2000-125, s. 1; 2000-140, s. 91; 2015-282, s. 1.) Now for an update on this charge. 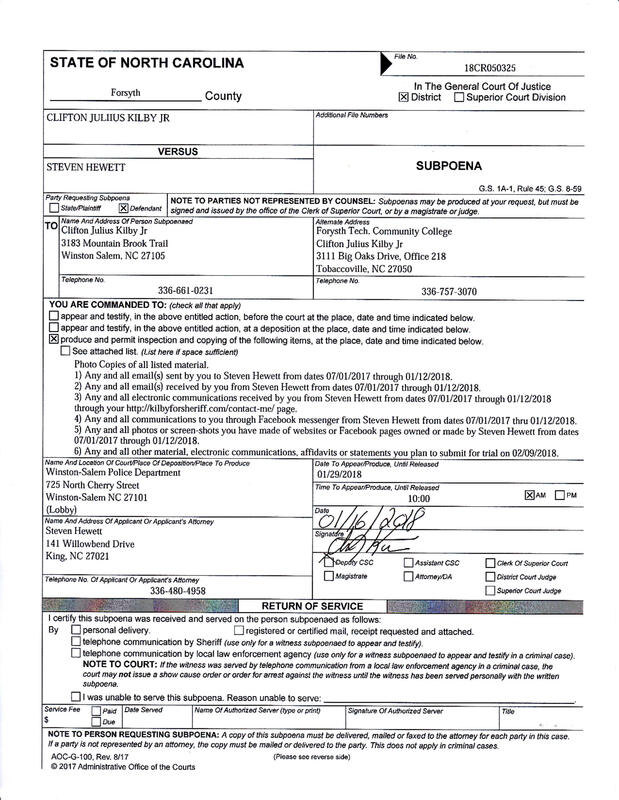 Through discovery by two subpoenas Kilby was not able to produce any document to support his affidavit in bringing the 50C No-contact order and the Cyberstalking charge, “he also has made posts that he fired his 10/22 rifle which is made to harass and [intimate], me, my family and close personal associates.” Please note I never wanted to be [intimate] with Kilby, his family or close personal associates. 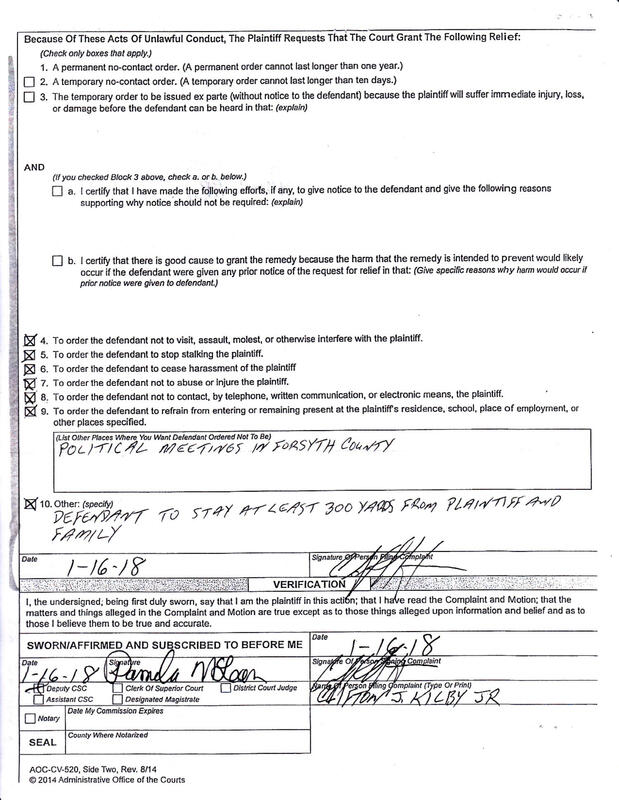 His grammar and spelling in his affidavit is certainly challenging and not what I would expect in a candidate for Sheriff. Kilby has now hired an attorney, Mark Jones of Bell, Davis & Pitt. If this sounds familiar it’s because Jones was the same attorney who represented Shouse in court and the same law firm that the City of King “used” for legal services until 2014. They are the same law firm that advised the City in my lawsuit against them. In July of 2014 the City of King put out a request to law firms to submit bids to represent the City in legal matters, according to the current City Manager, Bell, Davis & Pitt quit after being notified the City was entertaining other law firms. Information supplied by the City Clerk, shows they have been with the City goes back to 1987. No doubt there are some hard feelings there since the City record shows they paid them almost $434,000 from 2010-2014, with $213,702 of that being paid out for my lawsuit. The DA’s office is stepping aside and letting Jones do “private prosecution” of the case. Sounds very vindictive for Bell, David & Pitt to have Mark Jones one of their attorneys to personally prosecute me instead of letting the DA’s office do their job and pursue the case themselves. Is the DA’s Office stepping aside because there is no evidence that supports the initial charge and that Kilby made untruthful statements in his affidavit? 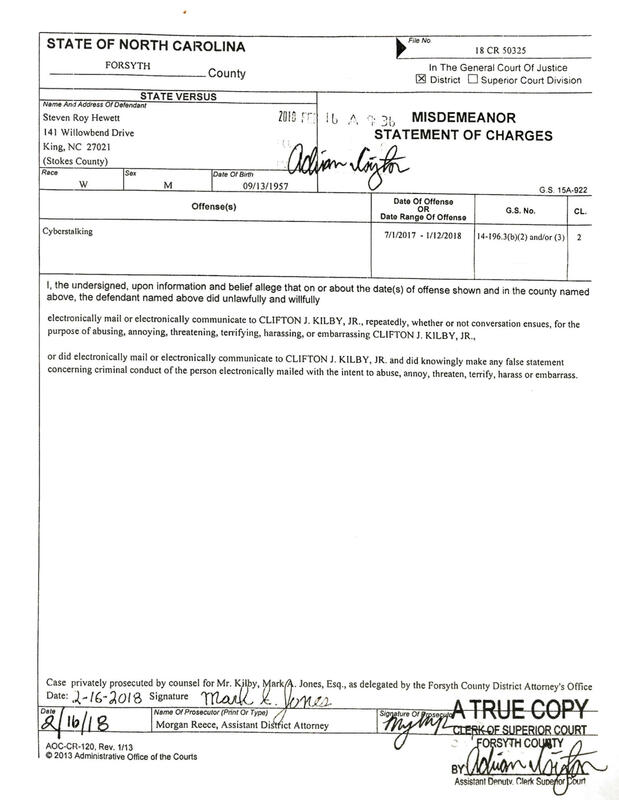 Speaking of charges ADA Morgan Reece has changed the charge from “threatening to inflict bodily harm” to harassment. ADA Reece, why are you stepping aside to allow “private prosecution” in this case and why change the charge? Maybe we all should do that from now on, hire our own Attorneys to prosecute people! The posting I really made not the one Kilby is claiming I made. My request for information from Dir. 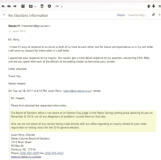 Perry concerning Kilby’s claims and advising him of what Kilby stated at the Legion Appeal Hearing. Kilby’s responding to Dir. Perry concerning my quote and Kilby denying he said it, yet on the recording of the hearing you can clear hear Kilby, caught with his own words! Dir. Perry’s email response confirming Kilby was untruthful at hearing concerning his claims I spoke with a judge and caused a problem at the precinct. He never went to or contacted the BOE about my registration. Ronald Shouse standing in the middle of the group flipping me off with both middle fingers. Kilby claims this was not Shouse but Jani Hamby. This is not truthful since Jani is seen standing in front of the red truck right headlight. She does not have a legion cap on, Shouse does. 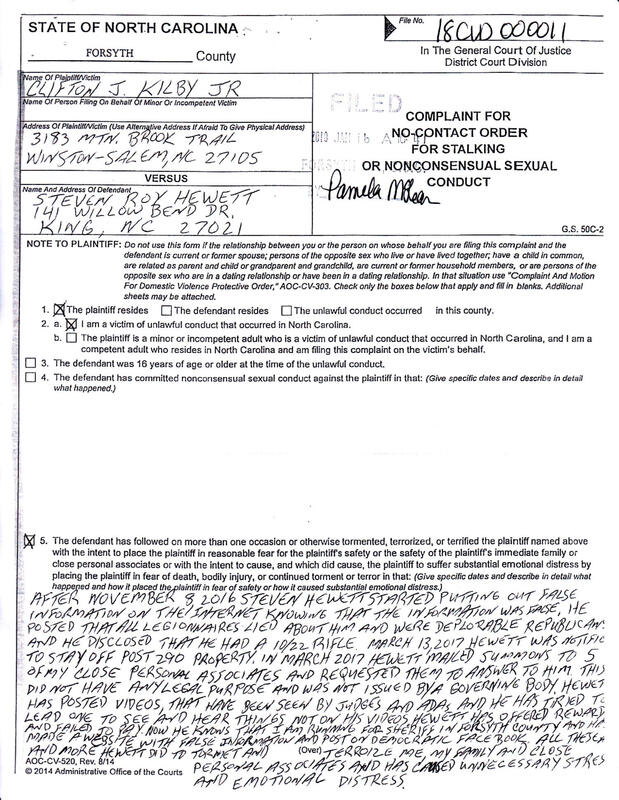 Kilby’s Affidavit to support his Cyberstalking Charge. 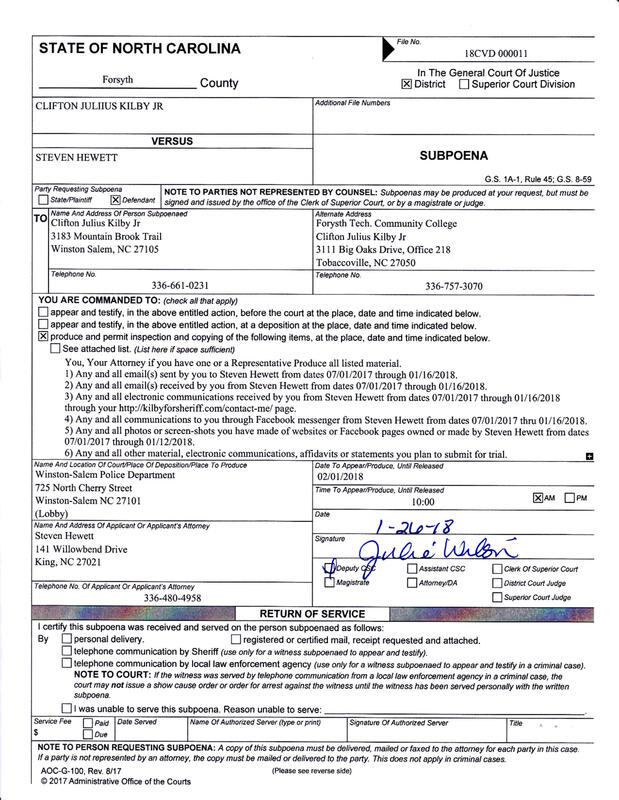 Kilby also took out a Cyberstalking 50C No-Contact order on Jan. 16, 2018 and I’ll just let you read his affidavit and the temporary order yourselves. I want you to think about your Constitutionally protected freedoms as you read this. 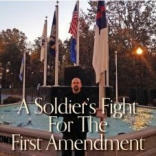 Mind you this all stems from making a Facebook Page against Kilby’s run for Political Office, Sheriff of Forsyth Co. Note, other places: Political Meetings in Forsyth County. This means he doesn’t want me at any and all Political Meetings in Forsyth County. Ask yourself, why? Cyberstalking Law, § 14-196.3. Please note section, (e) at the end. This Kilby’s affidavit to support a 50C and his request for restrictions. Vindication! 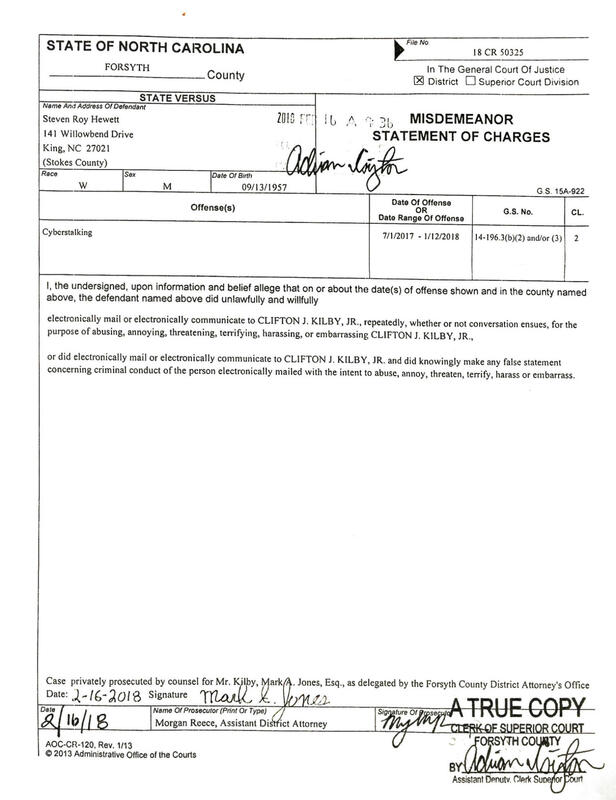 After almost six months of harassment, stress, intimitdation, the threat of going to jail, the loss of being on the United States AAU Karate Team and much more a trial took place concerning these charges Kilby had taken out on me in January 2018 the trial finally took place on June 7th. It was utterly amazing to listen to Kilby’s testamony in him trying to prove his accusations and deflecting some of this to the magistrates who filled out his summons and 50C. Bottom line is he and his attorney Mark Jones FAILED to produce any evidence to support Kilby’s claims. The 50C No-Contact order was DISMISSED! 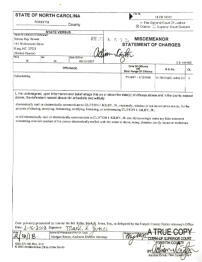 The Cyberstalking Charge found NOT GUILTY! What does this say about the kind of person Kilby is? Much more to be written and videos to be posted about what Kilby has said and done! Now for the Lawsuit against Kilby for Abuse of Process/Malicious Prosecution. Lawsuit was filed and served up on Kilby.